An Escape for the Mind, Belly & Soul! NOTE REGARDING CURRENCY: Our nightly rates are charged in Canadian dollars, which will be displayed to you at the time of online payment to complete your booking. Depending on the vacation rental website you are using they may display our nightly rates in US Dollars during your initial search. Our luxuriously-appointed, newly-built Canada Select 5 Star-rated 3 bedroom, 2 bathroom cottage plus 3 bed and 1 bathroom bunkhouse with stellar wood-fired cookhouse is located in the heart of the Points East Coastal Drive region near Souris, PEI. Indulge yourself in the comforts and unique amenities of this peaceful and private retreat and absorb the outstanding scenery and views while you explore the wonderful surroundings of the eastern tip of beautiful Prince Edward Island, Canada. As you walk up the boardwalk to the front door of this brand new cottage, the all-glass foyer welcomes you with ocean views to set the stage for your stay. Accommodating up to 12 people with complete comfort (6 in the cottage + 6 in the bunkhouse), our modern cottage will continue to amaze you with an open living great room concept and expansive ocean views through the 16 feet of glass doors overlooking Little Harbour Beach and Red Point! Set on 2.5 oceanfront acres with beautiful diverse views in all directions this private location has so much to offer for your perfect Prince Edward Island vacation. Built-in audio entertainment throughout the great room and covered deck is easily accessible via your Bluetooth-enabled device. For those family movie nights, slide open the barn doors above the fireplace to reveal the 55" 4K Sony TV with Polk Audio surround sound for a theatre-quality movie experience the whole family will love. Lastly, we have included a large outdoor shower that allows you to get the kids cleaned up after those long beach days or enjoy an "Al Fresco" experience of your own! Designed to handle additional guests beyond the comfort of the three bedroom cottage, the bunkhouse provides extremely comfortable sleeping and bathing quarters for up to six additional guests. Three queen beds with high-end mattresses in cozy sleeping nooks appointed with reading lights, power and phone chargers, plus plenty of storage for clothing and luggage make your stay as cozy as can be. Guests can entertain themselves in the bunkhouse sitting area with TV, Apple TV, high speed satellite Internet and even a kitchenette for drinks and coffee to start their day. The best part is that you get to enjoy your experience outside as the cookhouse is fully covered from the elements. So regardless of the weather, you can enjoy preparing, cooking, eating and entertaining in the cookhouse. Afterwards relax by the large fireplace or mingle on the adjoining deck until the wee hours. Seasoned and split brasero-ready birch and maple hardwood is ready for your use. A number of beautiful beaches await your visit. Access the outstanding Little Harbour Beach and bird sanctuary with safe walking access just 300 metres from our cottage! Enjoy this seemingly endless child-friendly shallow beach that families can explore and enjoy all day long. Feel like a walk? Stroll the 3 kilometres (2 miles) of white sand from our cottage to famous Red Point Provincial Park, or choose a short 10-minute drive to get there instead. A 12-minute drive from our cottage will lead you to the world famous Singing Sands beach at Basin Head Provincial Park, consistently ranked as one of the top beaches in Canada! Stop by the Souris Beach Gateway Park, just a 7 minute drive and experience the beach and local activities to spend your day enjoying kayaking or kite-boarding rentals, fresh lobster, mussels and clams, or relax and soak up some sun and eastern PEI culture. Dining near Souris offers a wide range of options, from quick and casual to fine dining. Some highlights include The Inn at St. Peter's Bay or world famous Chef Michael Smith's Fireworks at The Inn at Bay Fortune, a unique wood-fired feast experience you will never forget! If visiting Cavendish, plan to enjoy the one and only Pearl Eatery in North Rustico. Souris ensures you are well poised for a wide range of classic PEI activities including world famous Bluefin Tuna fishing, the ultimate game fishing experience! Prefer something a little calmer? Try a clamming or whale watching adventure with a local charter. Catching the ferry to Les Îles de la Madeleine? Souris Harbour is a quick 7 minute drive. Visit the Elmira Railroad Museum and take the family on a beautiful miniature railway ride through the trees and hills of this beautiful property. Also stop by the East Point Lighthouse for a tour of a historic lighthouse and learn the history of these amazing structures. See the famous confluence of three tides at the island's most easterly point, as the Atlantic Ocean, the Northumberland Strait, and the Gulf of St. Lawrence all come together. Plan to enjoy PEI's outstanding golf courses and choose from world class Brudenell & Dundarave, Links at Crowbush or Avondale, each just 45 minutes away. Fox Meadow, Belvedere and Stanhope, while a little further are well worth the drive. Located in Cavendish, a 90 minute scenic drive from our cottage through the rolling hills and quaint townships of Prince Edward Island that will leave an impression of the island you will not soon forget. While there, you can enjoy the fun at Sandspit Amusement Park, Shining Waters water park or many other family activities. As you walk up the boardwalks to the front doors of this brand new cottage, the all-glass foyer welcomes you with ocean views to set the stage for your stay. 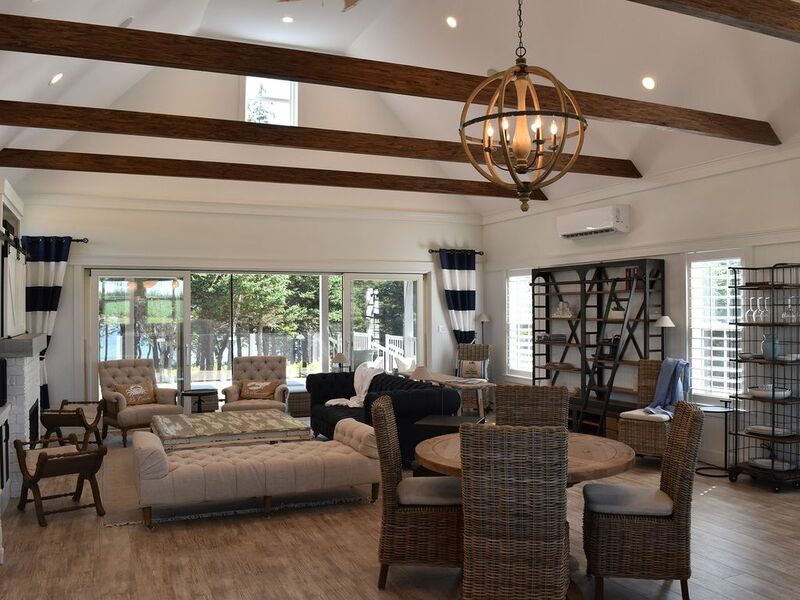 Accommodating up to 12 people with complete comfort, our modern cottage will continue to amaze you with an open living great room concept and expansive ocean views through the 16 feet of glass doors overlooking Little Harbour Beach and Red Point! Our one of a kind wood fired cookhouse allows for a truly unique and unforgettable outdoor experience! Stop by the Souris Beach Gateway Park, just a 7 minute drive and experience the beach and local activities to spend your day enjoying kayaking or kite-boarding rentals, fresh lobster, mussels etc. Access the outstanding Little Harbour Beach and bird sancturary with safe walking access just 300 metres from our cottage. Enjoy the sounds of the majestic PEI ocean waves and wind as you relax and read a book or enjoy a cocktail on our 1500 square foot deck. Telephone in cottage and bunkhouse for local calls and emergency use. Air conditioning throughout the cottage and bunkhouse. Electric zoned heat in all rooms. Top of the line Bosch laundry. Spacious parking available for multiple vehicles including dedicated RV parking with full services. Dual Internet connect with primary high speed satellite Internet and DSL for redundancy. Inside enjoy a large supply of luxury hotel towels. At the beach lovely oversized beach towels as well as dedicated outdoor shower towels. Covered cookhouse regardless of the weather, seating up to 24 guests comfortably. Large fireplace with adjoining deck. Seasoned and split brasero-ready birch and maple hardwood is ready for your use. Thermador and Sub-Zero appliances, built-in refrigeration throughout kitchen & chef's island. Top of the line 48" Wolf range with 22" double griddle for the ultimate in cooking. Wolf dual wall oven and heating drawer. Built-in Thermador drawer microwave oven. Fully equipped kitchen with essentials. German-made WMF, Wolf and Fissler cookware, Messermeister chef's knives. Designer matching Kate Spade New York dinnerware for 12 guests. Salvaged wood trestle rectangle dinning table accommodates 12 comfortably. Additional salvaged trestle round table for more intimate dinners of 6. Satellite TV in all bedrooms and cottage living room. Built-in Bluetooth audio within the cottage great room. Connect your favourite Bluetooth device to the audio system and enjoy your music throughout the great room and outside covered deck. A variety of classic board games for your enjoyment. 200+ movies available on demand within the cottage and bunkhouse via built-in media server. 2.5 acre property with large flat sports field including soccer nets and a variety of outdoor activities available for your enjoyment. Large 1500 sq. ft. deck with two covered areas and plenty of patio furniture for your enjoyment. The Bunkhouse is designed to handle additional guests beyond the comfort of the three bedroom cottage. The bunkhouse provides extremely comfortable sleeping and bathing quarters for up to six additional guests. Three queen beds with high-end mattresses in cozy sleeping nooks appointed with reading lights, power and phone chargers, plus plenty of storage for clothing and luggage make your stay as cozy as can be. Guests can entertain themselves in the bunkhouse sitting area with TV, Apple TV, high speed satellite Internet and even a kitchenette for drinks and coffee to start their day. The Cookhouse is for the truly adventurous or self-proclaimed grill lovers. Broaden your experience or test your grilling skills on our authentic custom-built Argentinian Parilla wood-fired grill, wood-fired pizza oven and wood-fired smoker! Enjoy your experience outside in the covered cookhouse regardless of the weather, seating up to 24 guests comfortably. Nicole and Steve have created a unique experience for foodies and just great getaway retreat where you can spoil yourself with the latest in asado, stone oven and smokers in your cookhouse only yards from the sea. In addition the main dwelling features a fully equipped kitchen which could easily seat guests of ten and accommodate their culinerary needs. We thoroughly enjoyed the ambience by the sea as well as participated in cooking some heroic meals ....a truly wonderful place as well as a great location for secluded beach walks as well as access to this beautiful part of PEI. We will return to enrich our bellies once again! Thank you Nicole. There was nothing that we didn't have. There was nothing missed; attention to every little detail. Accommodations were exceptional. I've got an extremely picky family, they were all in Aww. Large family from seniors to little ones; all completely satisfied. Cookhouse was awesome and a big crowd pleaser, aside from the beautiful house itself. Took advantage of the wood burning pizza oven, Argentinian BBQ, smoker, and wood burning fireplace. We dined out there as much a swe could. Don't forget all the tools, manuals and details that came along with everything; CRAZY!! Great place to relax and cook! Beautiful home in a beautiful location. Awesome indoor and outdoor cooking facilities if you love to cook. Great beach access, comfortable rooms, everything well appointed. The hosts are fantastic and were immediately available for questions. Our family really enjoyed our stay. Our large group of 3 families chose this cottage based on the photos and location near Souris. We are so happy we did! We were told by friends that the eastern Prince Edward Island beaches are beautiful and they were even more beautiful than we expected! Walking distance to the beach made this cottage perfect for our small children. Nicole and Steve provided soooo much: beach chairs, coolers, beach toys for the kids and even a utility wagon to carry all of our stuff down! The cottage is more beautiful than the pictures represent and property is simply gorgeous. Impeccably clean and fully equipped! It's so peaceful and relaxing while you gaze out over the ocean and beaches and listen to the wind in the trees and the variety of birds singing all day. We relaxed on the enormous deck while the kids played in the large grass field. Of course we tried the cookhouse several times - it was beyond amazing! Along with cooking our food and enjoying outside, we also enjoyed the ambiance of the fireplace outside next to us. The beds were extremely comfortable with plush pillow top mattresses, plenty of pillows, beautiful linens and quilts. The bunkhouse was a treat for the kids. There was plenty of space for 11 of us and it was such a pleasure to be able to stay together in a single cottage. Souris is a five minute drive and has everything we needed and we spent a day at the Souris Beach Park where we rented paddleboards, enjoyed delicious lobster sandwiches and oysters and searched for seaglass. Overall this was an incredible vacation that we enjoyed at this very special cottage. Thanks so much to Nicole for the gift basket - such a treat! We can't wait to come back! This is our second opportunity to have stayed at this amazing property. This year we were a group of 3 families, 11 people in total. We had ample space both indoors and outdoors, enjoyed beautiful weather at the white sandy beaches that are walking distance from the cottage. Our kids played in the large fields and we enjoyed the ocean views to the east through the park-like forested front yard and the endless golden wheat fields in the back. We ate at Chef Michael Smith's Fireworks at Inn at Bay Fortune - just a 15 minute drive - OUTSTANDING! We also ate a 21 Breakwater, one of the local restaurants 5 minutes away and enjoyed the improvements at Souris beach where we rented paddle boards for the day and enjoyed the best lobster rolls around at the Lobster Shack. Most evenings were spent in the cookhouse by the fire or making some apples in the pizza oven. We even tried our hand at the authentic Italian pizza - Nicole provided a basket of all the required ingredients and instructions! Thank you very much Nicole and Steve for the great gift basket and your wonderful hospitality again this year... we will definitely return next year. Our family couldn't think of staying anywhere else! This property is truly a gem. We had the most amazing vacation here! The cottage and the beach were beautiful, beyond our expectations, and Nicole thought of every little detail to make our stay comfortable. We were traveling with our extended family which included four young children and the cottage was perfect for them - lots of outdoor space to run around and a very child-friendly beach where they were happy to spend most of their day. I really can't recommend this place enough.